Fortrans has integrated our patented Dif-Jet gas injector into a remarkably simple and low-cost water deaeration system for process applications. These systems deoxygenate water by injecting and circulating nitrogen gas into a closed-head deaeration tank to displace the oxygen. Oxygen is an oxidizer. It will react with anything organic, or combine with metals and salts in water. In the case of food or beverages, oxygen will start the biodegrading process, which in turn will affect the taste, odor, and shelf life of a packaged product. In regards to hot water or steam production systems, the oxygen will react aggressively with metals and cause corrosion and pitting of heat exchangers and piping. Many hot water system owners must add expensive oxygen scavengers to prevent aggressive oxygen attack. Using a mechanical deaerator for oxygen removal can be both more practical and economical in hot water and steam systems in lieu of using oxygen scavengers and other chemicals. Breweries use deaerated water to ensure shelf life and taste in their canned and bottled products. Food plants that package fresh vegetables or other water-based products use deaerated water to improve taste, color, and extend shelf life. One method currently used to produce deaerated water uses membrane filter systems. These deaeration systems are sized and priced at various capacities in terms of gallons per minute. These systems require a 7.5 HP or larger vacuum pump. The membrane filters require regular maintenance and or replacement depending on the purity of the water source. Membrane filter systems are labor intensive to clean and sanitize in food or beverage plants. Other more mechanized systems use boiling water and vacuum pumps to remove the oxygen from the water. These types of system have high energy consumption and are priced by gallons per minute of deaerated water required. These types of systems are common in coal and gas power plants, where heat transfer efficiencies need to be optimized. 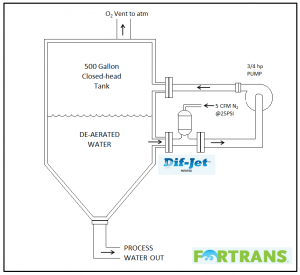 Fortrans Inc. has developed a new way to produce low cost deaerated water by integrating our patented Dif-Jet gas injector into batch production of deaerated water in storage tanks. 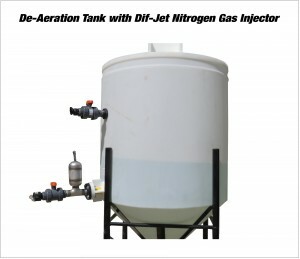 The Dif-Jet gas injector will efficiently inject and mix nitrogen gas into a circulation tank. The nitrogen, being highly soluble in water, will displace the oxygen from the water without requiring a vacuum pump, heat, or other device. The oxygen is vented out of the top of the tank naturally and automatically. Fortrans conducted testing using a 500 gallon closed head polyethylene deaeration tank with a single Dif-Jet gas injector. A ¾ HP circulation pump is connected to the injector piping, which is connected to the intake and discharge fittings on the tank. The injector is connected to a regulator installed on a standard 300-cubic-foot cylinder of nitrogen gas. Paired with a nitrogen generator, this system can provide a continuous stream of deaerated water at nearly half the cost of membrane filter or vacuum pump systems. The nitrogen gas injector was fed 5 CFM of nitrogen at 25 psi to produce 500 gallons of deaerated water in 25 minutes. 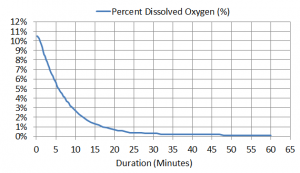 The treated water had a dissolved oxygen content of less than .1 mg/L. Faster deaeration times can be achieved by using a manifold of 2 to 4 Dif-Jet gas injectors to deaerate larger treatment tanks and maintain a constant supply of deaerated water. A PLC controller may be used to produce a constant supply of deaerated water to customer specification.